Domain authority plays a prominent role in your site's ranking potential. It's the industry standard for measuring how strong your domain is in comparison to other sites. And as of early 2019, Moz made significant updates to it. And we're all freaking out! Not in a bad way. More in a "this is awesome!" way. Before diving into domain authority 2.0, let's start from the beginning. In its most basic terms, domain authority is a predictor of how well your site ranks in search engine result pages (SERPs). But let's clear up a common misconception. Domain authority is not a metric used by Google and does not have a direct impact on SERPs. It's a proprietary score developed by Moz, and it's used to compare sites and track ranking strength of sites over time. It's an important score to pay attention to for many reasons. The main reason it's so important to your company is brand visibility. Generally, your domain authority shows if your users trust your site as an authoritative force in your industry, among your competitors. Without knowing your domain authority, you could miss out on critical traffic and revenue opportunities and be left behind in the competition. And the recent changes Moz rolled out are making this metric more reliable. What Changed With the New Domain Authority? Instead of training the metric against unmanipulated, large sets of search results, they switched to a neural network, helping it detect link manipulation. The metric has been improved at understanding sites that don't rank for any keywords. They integrated their proprietary spam score and link distributions (based on quality and traffic) with it. Bottom line: Domain authority is more reliable and accurate than ever before. But keep a few things in mind as you focus on it. Use it as a metric to compare to your competitors, not as a standalone. Embrace ongoing updates because Moz vows to keep it updated as Google evolves. Don't worry if your score dropped a bit following the Moz update, which happened on March 5, 2019. With all this mind, there's one more thing you need to keep in mind as you prepare to improve your score. To start building your authority, first you need to look at your current score. You might be wondering what many others think: what is a good domain authority score? This is a complicated questions because, as we just covered, it's a comparative metric. So you shouldn't simply set a goal to earn a super high score. Sure it'd be awesome to have a 100, but that's not realistic. Instead, you should be looking at how your score stacks up in your industry, then set goals to score higher than your competitors. Not to dodge the initial question, but there really is no good or bad score. You're either beating your competitors or falling behind them. Another important fact to keep in mind: Moz scores your domain authority on a logarithmic scale, from zero to 100. So you can easily jump from 10 to 20 to 30, but moving the needle from 67 to 82 is far more difficult. Now that you're caught up on all things domain authority 2.0, let's look at how you boost your score moving forward. 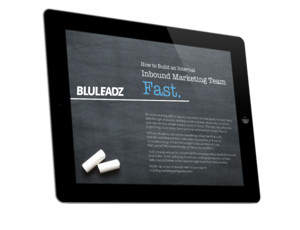 There are plenty of awesome tactics you can start implementing into your strategy right now. 1. Check Your Current Page Rankings. It's hard to know what is causing your low domain authority and page rankings without delving into the data using SEO tools. Moz is obviously the go-to for all things related to domain authority. 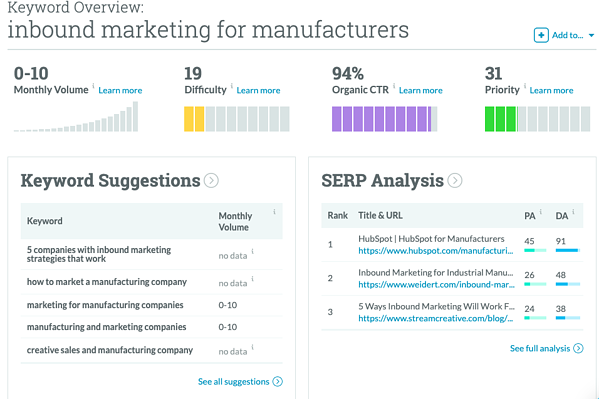 You can find your score using several tools within Moz. This SEO toolbar is free and super easy to use. Simply download it, then enable it within Chrome. It automatically pulls plenty of great data on the webpage you're on. You can see our page authority, domain authority, and the number of links from root domains all in this window. It also presents this information in the SERPs. 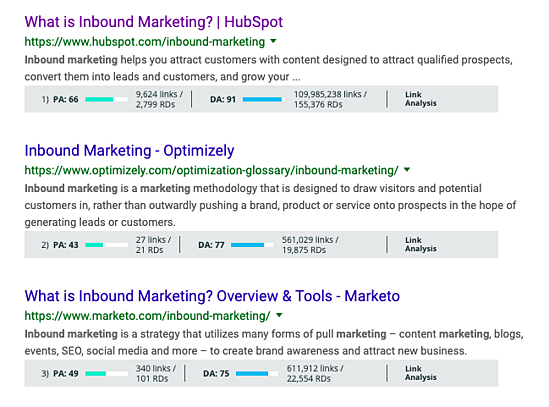 For example, these are the top results for the search "inbound marketing." This makes it easy to gather score information from top ranking sites in no time. You can also access your spam score, build link tracking lists, compare link profiles with your competitors, and use the link intersect feature to find sites linking to your competitors but not you. 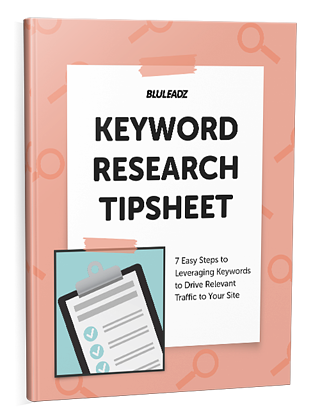 As you're conducting keyword research, you can also assess scores from your competitors within the keyword explorer feature. For example, I looked up "inbound marketing for manufacturers," and this is the data you get instant access to in your dashboard. As you can see in the SERP analysis, you get a bird's eye view of top ranking sites, including information about page authority and domain authority. In addition to Moz, other SEO analytics platforms like Bright Edge, and Ahrefs offer similar tools so you know where you stand among your competitors. Do you notice a recurring theme within the domain authority world? You need to see what your competitors are doing and how their score is evolving. There are so many awesome competitor analysis tools and free SEO tools that easily let you compare your site to your competitors based on domain authority, number of links, keyword rankings, and more. One of the most noteworthy tools comes from SEMRush. Their Domain vs. Domain feature, giving you a side-by-side look at your domain compared to similar websites for various keyword phrases. But don't just stop at these reports and insights you get from tools. You should also do some manual digging. For example, subscribe to your competitors’ newsletters and follow them on social media to evaluate their marketing strategies and see how effective their tactics are. You can better understand what topics are trending and which content opportunities you may be missing out on. 3. Build Links the Right Way. Links to your site act as a vote of confidence to your content. It tells search engines that you're an authority figure in a specific niche. Your backlinks impact your ability to raise your DA score. According to Link Assistance's SEO PowerSuite Link Building 2017 Report, a staggering 72 percent of SEO professionals agreed that backlinks play a significant role in rankings. If users believe your site has authority and want to spread your message and posts, they will naturally want to link to your site. The more votes from users, the more search engines view your site as being trustworthy and useful, contributing to higher rankings. Avoid Adding Low Quality Backlinks. The old adage applies to link building too – quality over quantity. The domain and page authority of the backlinks themselves have a significant impact on the quality of the inbound links and how they influence your own page rankings. Get a list of backlinks for your top pages and see whether they are from high quality sources like newspapers and other media outlets or institutions of higher education. Celebrate the high authority ones. Great job! Continue to build links by using outreach to connect with more high authority resources. For the low quality links, determine where they're coming from and find ways to remove them. They're easy to spot if you can tell they came from black hatters. Black hat SEO involves deceptive practices like buying links placed on other sites or spamming links on directories and forums. 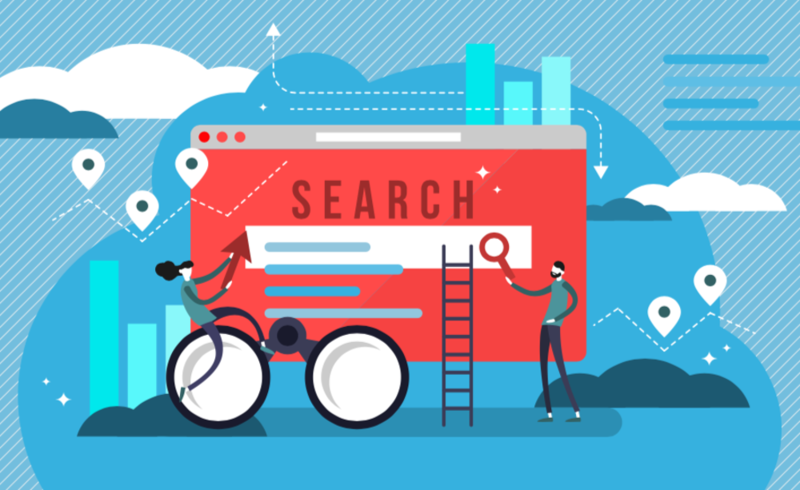 On the other side of link building, some sites will link to your site – especially if it is already an authoritative and popular site – to try to improve their own rankings. Scan for these low quality links whenever you perform a comprehensive site audit and act fast before you incur rank penalties. Remove the Existing Bad Backlinks. During a content audit, if you discover spammy sites link to your site, there are two popular ways you can prevent these sites from going to pages. The first is you can make a list of these sites and email the webmaster for each site, requesting that they take down the links. What can you do if low quality sites ignore your plea to take down their links, impacting your domain authority? Google devised a way to avoid this by disavowing links. You can disavow backlinks to avoid having search engines factor in these low quality links when determining your site’s rank. Google has a Disavow Links Tool where you can see the links to your site and decide whether to disavow these links to save your rankings. It defines the architecture and hierarchy of your site. It helps your visitors navigate your site to consume more content. It distributes page authority throughout your site. This builds a better user experience for your visitors because it directs them to other relevant content they'd be interested in. They feel more inclined to keep reading by clicking on related pages, eventually ending up on landing pages designed to incite user action. 4. Beware of Any Site Penalties. Sites involved in black hat SEO practices are typically penalized by Google, but even if content managers don’t engage these techniques, they may see their sites being downgraded because of low quality links. After the update to Google’s Penguin update, sites are now being punished for low quality links, including if they're involved in link schemes designed to inflate rankings. You can check out whether your site is the victim of downranking or being taken off search results because of spam or other problems by going to Google Webmaster Tools and accessing the Manual Actions report. This is where you will find penalties that impact your entire site or individual pages. Google will list the reason why certain pages were downgraded in rankings because of quality guideline violations, giving you the chance to fix them to improve your page position. User experience is a huge factor in whether visitors decide to link to your site. But if your site is hard to navigate or if it has broken links to pages that no longer exist, this makes it difficult for users to find what they are looking for and lead to them leaving the page before clicking on another. To enhance your overall user experience, review your site navigation and content structure. See if it is easy to find particular pages by breaking down content into specific sections and subsections. You can also determine whether certain design choices like font color and size negatively impact site navigation. You may have to restructure your site architecture or redesign your page navigation to ensure your user experience is where it should be. A key part of link building is creating content that gets people excited to share it. Grow site awareness by making content that is unique, educational or interesting. The Link Assistance survey found that the most efficient way to build backlinks was through data and research. You can create content like reports, whitepapers, and infographics that convey the data you gathered through polls, interviews and other research methods. Guest blogging is also a great way to start spreading awareness of your brand. You can guest blog for some pretty authoritative sites, which will get your company in front of more people, and earn a valuable backlink. Furthermore, change up the way you deliver content to make it more shareable. For example, turning a plain text blog post into a video can be an effective way to get more clicks and shares on social media. With all this new domain authority knowledge in mind, you're ready to boost your score. These tactics take time, but with consistent effort, you will see your ranking potential soar.